In her post today, Chris asked what unexpected benefits have come from blogging. This was easy for me, because I had already thought about it -- last May, I moved over 1000 miles to a city where I knew exactly two people (neither of whom was a good friend, although they're both very nice). Unless you count going away to college, I had never moved anywhere alone before. But I didn't feel alone, because I brought all of you with me! Even though I've never really met the majority of you IRL, I knew you'd follow me to Iowa City. And you made the move easier. So -- thank you so much for hanging with me! You've really helped! Before I get all sappy -- good things also come from UPS! I came home for lunch, just in time for the UPS man to leave this on my doorstep. 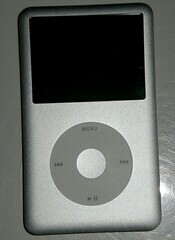 That's a new 80gig iPod -- 20 times bigger than my old one! Although the cute Nanos tempted me, I decided to go with the Classic (with room for 10 times as much stuff!) for just $50 more. And the fact that I had $50 in Amazon gift certificates helped! My old 4gig 1st generation pink Mini (btw -- why would anyone pay that much for what was old technology when I bought it three years ago?) was 100% full, but that barely scratches the surface on this one. Plus, if I should want to watch a movie on a two and a half inch screen, I can! And my Mini will have a good home with my 11-year-old niece. For $9.95, I added this to my shipment. It's basically an old-style portable radio. I've been concerned that my one, ancient battery-powered clock radio would die during bad weather (remember, I live in tornado country!). This one is small enough to carry around with me. 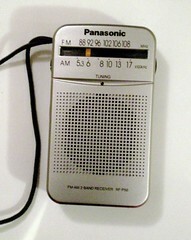 However, it's not nearly as cute as the pink transistor radio, with its single earphone, I got for my 8th birthday! I know what you mean - even though I was at home for 6 weeks on medical leave, I never felt isolated. Congrats on the new ipod! I've been meaning to wander over to get a crankpowered radio at some point. I do have a tiny, tiny old mp3 player that does have a radio in it and is AAA battery powered, just in case. I haven't succumbed to the iPod blast yet - but I have a tiny Sony radio, smaller than yours there, even. It has a BUNCH o' buttons for preset stations, takes just one AAA battery (I use rechargeables) and - get this: I can pick up CBS-TV on it! Most of the teevee I watch is on CBS, and I love that feature. (Dirty little secret: I watch dr phil...I know, I know, nevermind) but it's amazing how a lot of teevee shows are just FINE with *only* the audio! If I hadn't found your blog and read your profile I would have never put 2 and 2 together that we worked at the same place in SA! I've got one of those hand-crank radios in my "emergency" box. Not really tornado-y out here, but it can happen! The blogging goes both ways. Reading about the ups and downs of your life somehow makes it seem like you're not quite so far away. I have the iPod video and am now REALLY wanting an iphone...maybe I spring for one this summer.